Fitness is controlled exercise that targets specific muscles or skeletal areas with the goal of strengthening the entire body over time. Fitness builds up and strengthens muscles and bones, achieving balance, increasing brain activity and overall health and reducing the number of injuries while performing in dog sports or playing in the back yard. 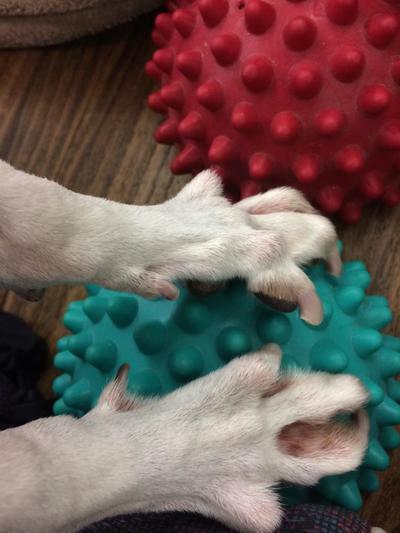 Proprioception -- or the awareness of one’s limbs, bones and muscles and what they do -- is important not only for sport dogs but also for pets and weekend warriors. The more the animals know how to use their bodies, the better they can safeguard themselves from injury. Fitness is not a young dog’s game. It is important for all ages, from puppies to senior animals. Although the daily walk or romp outdoors remains an important part of an overall balanced life for the dog, it is not possible to challenge the body in the park in the same way it is on equipment designed to teach moves that lead to excellent fitness. 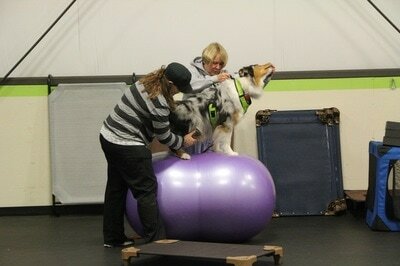 Fitness in performance dogs is especially crucial. For example, a dog competing in agility is required to to move and bend its body in ways that it cannot learn while just walking or playing fetch. Agility dogs have to be hyper aware of where all four of their feet are, how to use them and how to twist, turn and adjust their bodies to avoid injury. Many of these positions are not natural movements for the dogs. Using fitness equipment and moves to isolate bone and muscle groups and to trigger body awareness helps reduce injuries and increase overall performance. How do I teach fitness? Fitness is achieved by using proper equipment designed for this purpose, and proper technique taught by someone trained to teach fitness. I am certified in not only Canine Fitness but Canine massage as well. 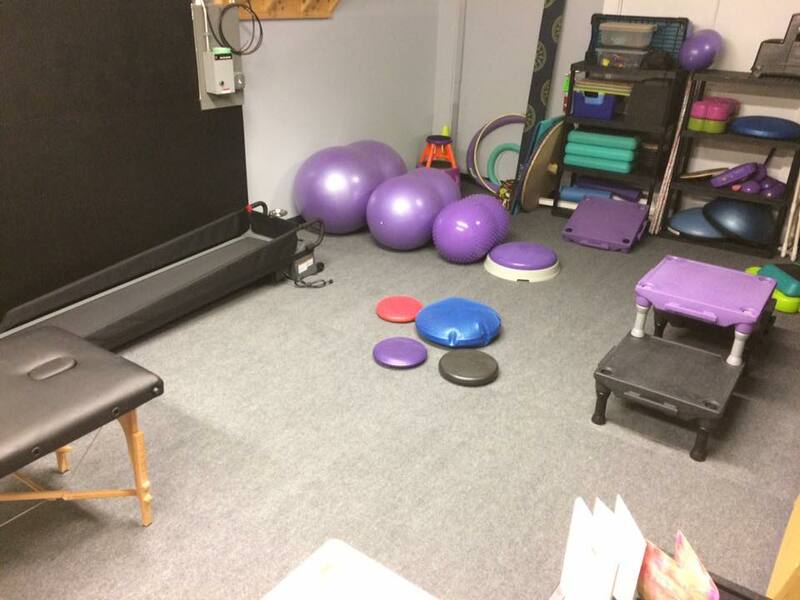 The studio is full equipped with Totofit, Fitpaws and custom made pieces. 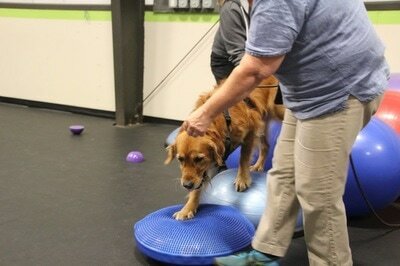 They range from balance balls, climbing tables and ladders to a specially designed treadmill for dogs of all sizes. The first thing I do is establish a fitness baseline with a new client, which simply is the fitness level where the dog begins its regimen. This is used to measure progress throughout the program. Weight-shifting methods are used to build strength, by raising one end of the dog higher than normal and therefore increasing weight load. This instability engages the stabilizer muscles and the “core” muscles -- those that help the dog run and jump and move or sit still. Increasing instability also increases load, which increases strength. Dogs are taught how to twist, turn and adjust themselves safely. Various surfaces are incorporated to encourage healthy feet. Some of the benefits of fitness are: fewer injuries due to slipping or collisions with other dogs; more muscles targeted overall than other forms of physical challenge; dog’s brain benefits from interacting with the equipment; training for dog sports that require precision, such as obedience, stays fresher between competitions. But one of the most important benefits is that fitness is another way to have fun with your dog!! 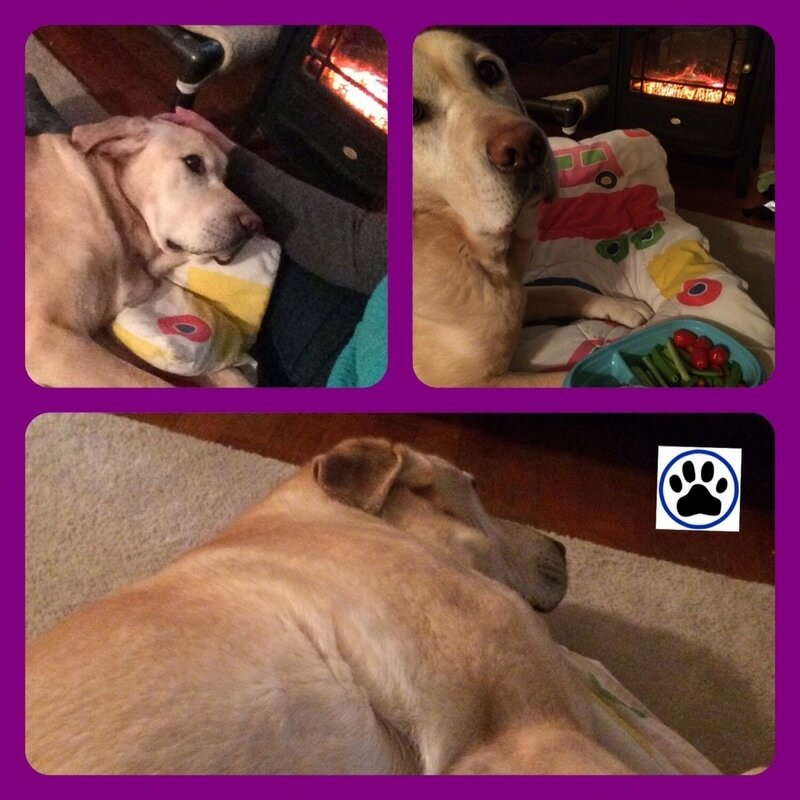 Massage is good for puppies, couch potatoes, athletes and seniors alike. 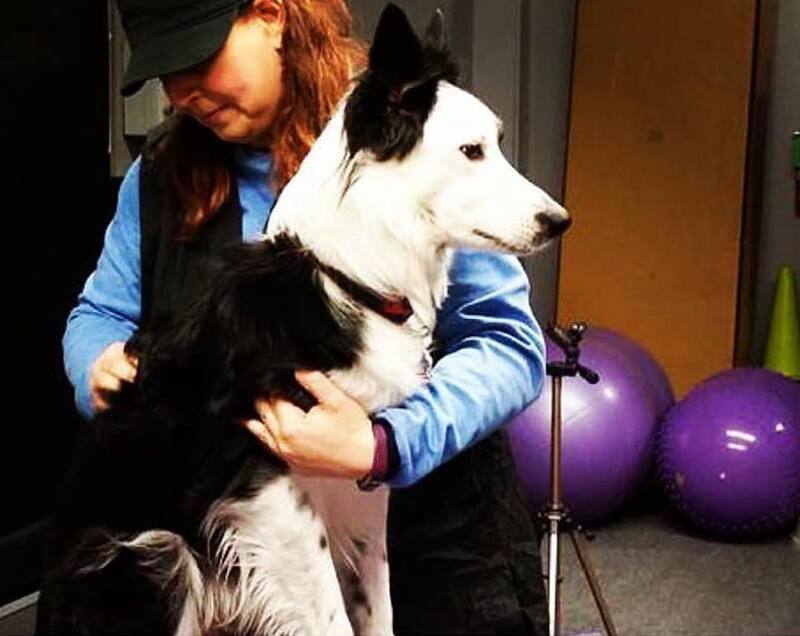 FITwell Massage complements your canine fitness program by addressing the entire dog and helping to maintain overall fitness. Tight muscles have reduced ability to perform correctly. They can pull joints out of alignment, resulting in other muscles having to compensate for the improperly functioning ones, thus making it more likely the dog will injure itself. **FITwell Massage does not treat an illness. 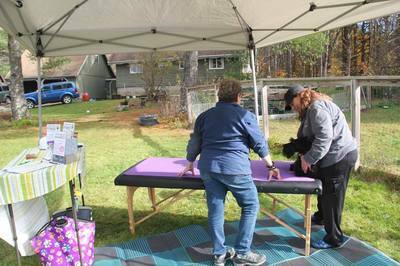 In order to be diagnosed or treated for an injury or illness, dog owners should consult with their veterinarians and obtain a referral for Massage Therapy. *Rebeccah Aube completed coursework through Bancroft School of Massage Small Animal Program, a 200-hour comprehensive certificate program that included: Small Animal Anatomy, Behavior, Handling and Management, Massage Techniques I and II, Passive Exercises, Species and Breeds, Business Practices/Ethics, Marketing, Internship, and more. 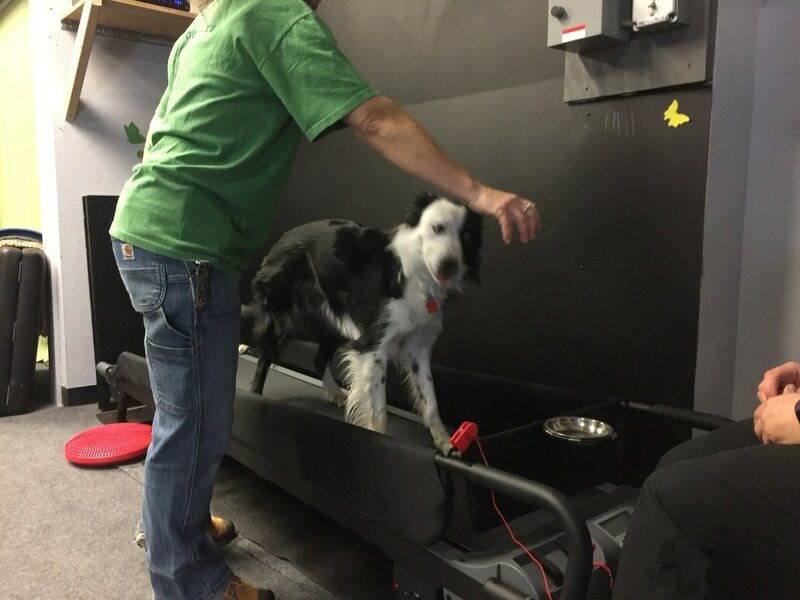 FITdog MAINE features a Large DOGTREAD ​treadmill. Why is this important? The length of tread is critical to the dogs ability to use full extension in their gait. A tread that is too short, which most human treadmills are, has the potential to actually shorten their stride and cause more problems. One of the best conditioning exercises you can provide for your dog is the Extended Trot Gait for approximately 20 minutes. This weight-bearing exercise works both sides of the body evenly. It is very difficult to maintain this gait consistently outside because of terrain and distractions. Plus it helps you keep track of mileage and time. 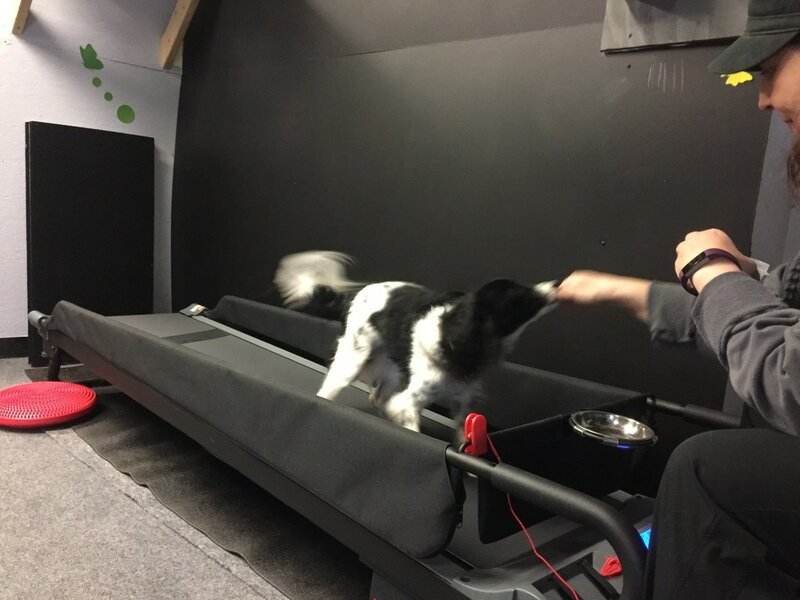 Plus there are many more activities you can do on a dog treadmill besides run. They include strength exercises, interval training and more. Running outside means that your dog is tempted to stop and sniff often. 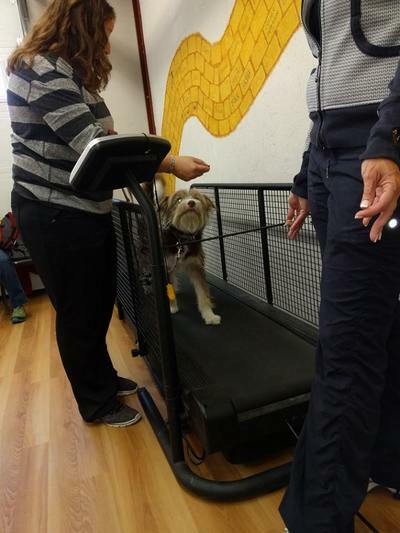 While this is also important to your dog’s overall well-being, it doesn’t help to keep the heart rate elevated to promote overall conditioning and health. Dog’s that exercise with intensity burn more calories and produce more feel-good endorphins which packs a double fitness punch for weight management and behavior. Joints that aren’t moving become rusty. Exercise, massage and good nutrition can help lubricate the joints and tissues. That being said, once a dog has one of these conditions controlled continuous motion (and nutritious food) can be a key in strengthening these areas to reduce soreness, but it is important not to overdo and to exercise on a surface that won’t cause additional strain and pain. $5 off Massage appointments during 4 weeks. Can't find a Canine Fitness class that works with your schedule? 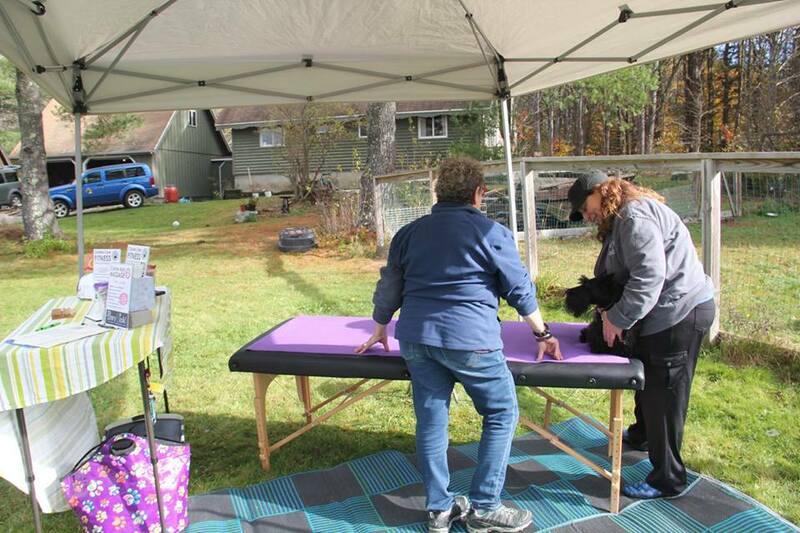 Massage therapy available with vet referral. Contact Rebeccah for pricing. Grab a friend or two and spend 30 minutes in the gym working on your fitness plan. 3o minutes of private gym time for just your dog. 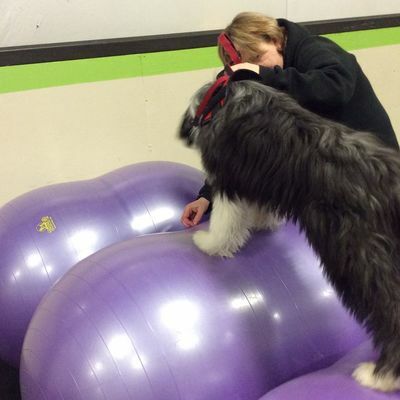 How did I end up with a doggie gym? I have been in dog sports most of my life, primarily obedience and flyball, but have tried other sports too. My interest in canine fitness began 15 years ago with my West Highland White Terrier Alex. Not known for having a sporty physique, a Westie playing flyball was unique at the time. I was concerned his body would not be strong enough to keep up with the demand of his sport, so I started taking workshops with Debbie Torraca, a founder of canine fitness and a well-respected canine rehabilitation practitioner. I began to teach a small group class to introduce dog owners to the idea that true fitness is different from the exercise dogs get from chasing a ball or swimming in a lake. Fitness is focused. Fitness targets and strengthens specifics parts of the body, conditioning it to meet the demands of performing a given dog sport. To equate it to human programs, it is weight training vs. aerobics class. Fitness vs. exercise. When Debbie offered me a chance to work with her directly, I jumped at the chance to be part of her certification program. 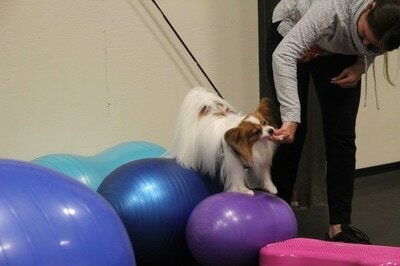 I love working with dogs of all ages in fitness. 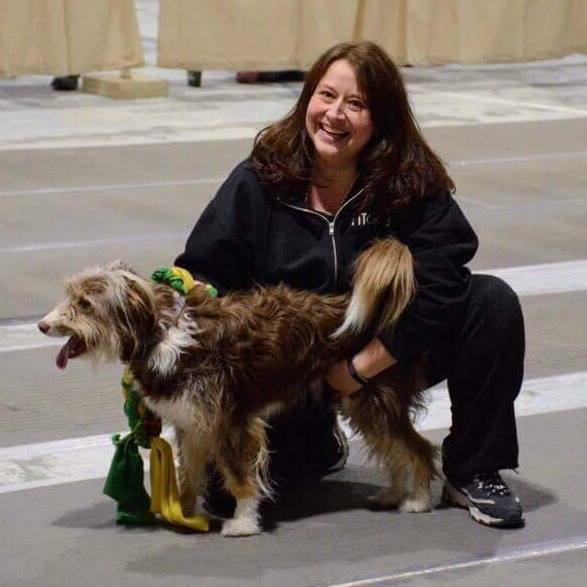 From watching puppies grow confident in their own bodies and discovering they have back feet, to focusing on specific needs for specific sports such as targeted fitness for agility dogs, to helping senior dogs stay not only physically strong but also mentally stimulated. Each experience is very rewarding to me. 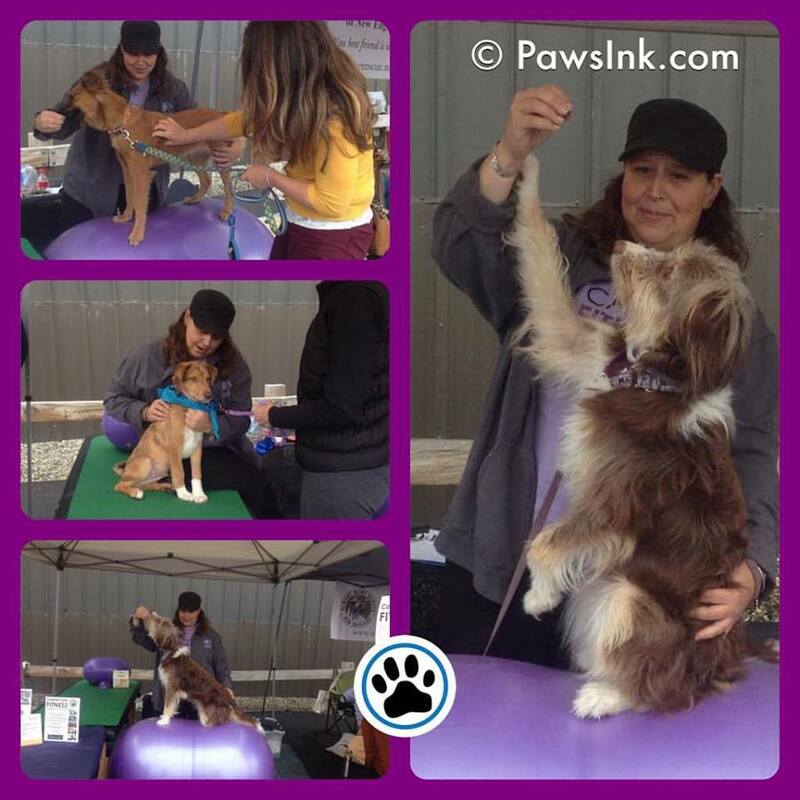 In my quest for more knowledge about canine anatomy, I enrolled in a massage program. It was a grueling yearlong program with 12 hands-on labs and lectures, along with online classes in between, while I worked at my regular job. 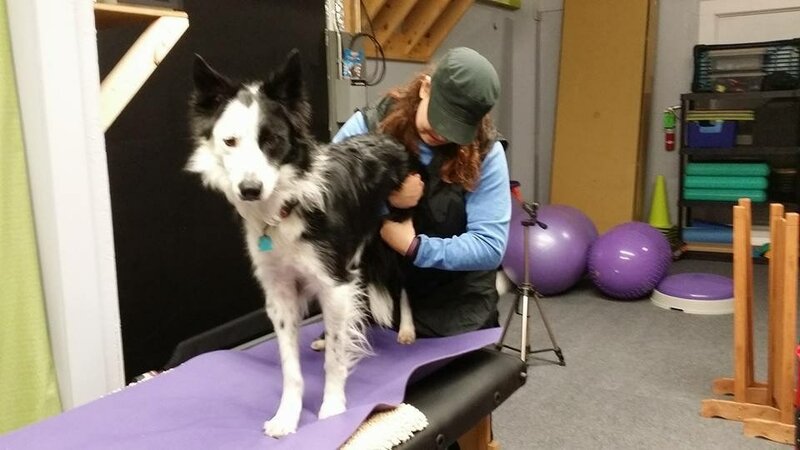 My single goal was to learn more about canine fitness, but I unexpectedly discovered that I love doing canine massage. Massage has become an intricate part of my fitness plans for my clients.